Why all the trot work? Mentally, I was born to be a dressage rider. Okay, that may be over stating things a bit, but there’s no question in my mind that this is the right sport for me. Details, mechanics, cause-and-effect – are all appealing to me. And I’m not an ultra competitive person that wants to take shortcuts to win. I really geek on good fundamentals and learning to do it right. Mentally, however, I’m also working on my confidence. My last ride on Jag before I retired him ended up in a high speed crash landing. I got to feel the speed that made him a stakeswinning sprinter … and then I got to know what it feels like to be dumped on a mounting block. (In case you’re wondering, it doesn’t feel good.) I was in a cast for six weeks after that episode, and it’s still with me. Enter Maddie, who is totally lovely under saddle but is a horse that will test you a bit. She’s more horse than Jag was, and while I don’t feel overfaced with her, I have a lot to learn with (and about) her, and she’s absolutely forcing me to be a better rider and horsewoman. She has the loveliest canter – the proverbial rocking horse rhythm, swingy and up-hill – but I still have balance issues and the transitions up especially intimidate me. So my endlessly patient and creative trainer Christy has been focusing us on precise work at the trot. Adjustability within the gait, developing solid contact, and improving our overall balance. I’m already feeling more confident, because the better contact equates to more responsiveness. And my improved strength and balance will help me ride the transitions gracefully when we add the canter back into the mix. 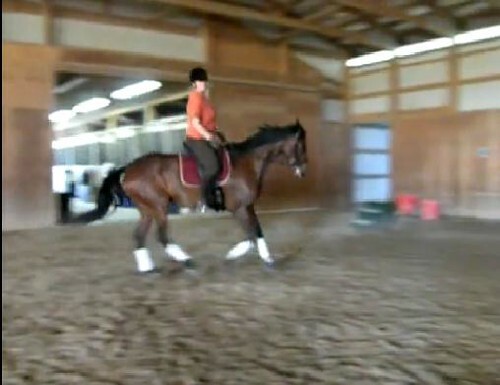 The trot work is giving me the foundation I need to develop quality canter transitions. 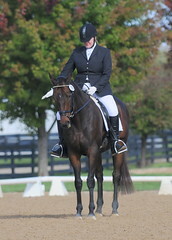 And therein is one of the things that I really like about dressage, and how Christy trains it. The building blocks prepare you for the next steps. What seemed unimaginable a few months ago is within reach today. Taking the time to get the fundamentals right is satisfying, and provides me the skills and confidence to progress.